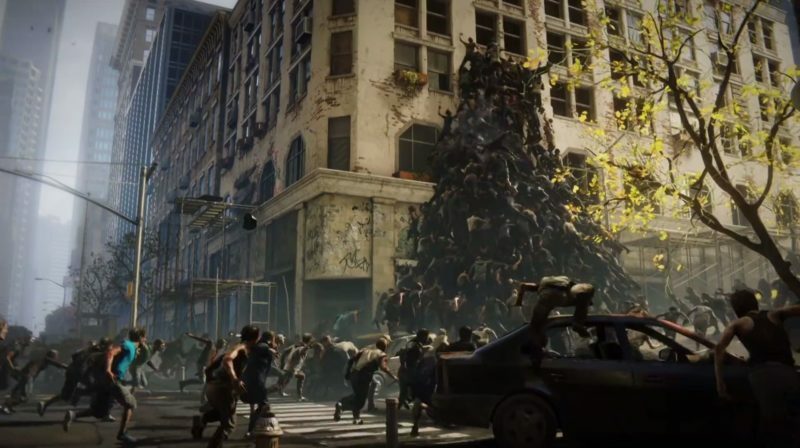 Oh yeah, there’s a World War Z game coming, isn’t there? Despite the general negative response to the “adaption” of Max Brooks’ excellent World War Z, the movie made like a bazzillion dollars and isn’t going away any time soon. In fact, along with the upcoming sequel, we have an upcoming game developed by Saber Interactive (Halo Anniversary, Shaq Fu 2 apparently?). We’ve gotten scant few glimpses of this title since it was revealed at the Game Awards last year. Finally, we have some in-game footage and even brief gameplay to see and… I’ll admit that recreating the “zombie pile-up” thing from the movie is actually pretty cool. Along with the trailer, we’ve got a brief description, stating “The game centers on unique survivor stories and missions around the globe, including New York, Moscow, and Jerusalem. Use traps, barriers and the environment strategically to stay alive while unleashing a storm of firepower with a variety of weapons on the unrelenting hordes of the undead.”. Neat I guess. I actually kind of like the film, so I wouldn’t say that I’m wholly against the idea of a game set in that universe with the “wave” style zombies (although that particular trait of the undead seems a bit much for this game, they don’t seem to move much different from other zombie games like L4D), but it’s still hard to get hype for this considering how many other similar games are out there/coming soon right now. We’ll most likely be seeing more at E3 in the next few weeks, so we’ll keep you updated.